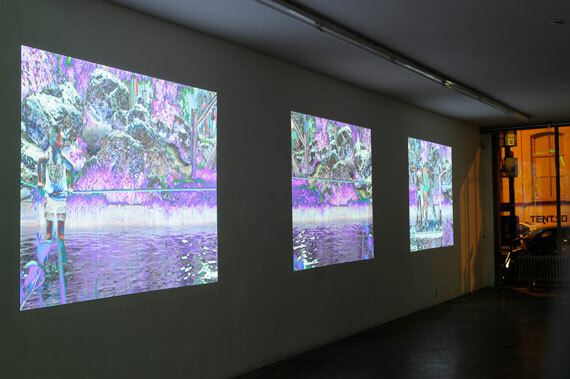 Videoinstallation: "The Raft" at MK gallery Rotterdam, show:"never ending stories"
“The Raft” is a triple video projection. On the left a boat floats away from a child that hanging on a piece of rope above the water. From the moment the boat leaves the child it looks like there is no way back. Some children on the raft try to bring the boat back. Sometimes others occupy them or they decide to play along with the other children. Mutual dependency, joy but also frustration can be seen in a chaotic play. A wide spectrum of human behaviour becomes visible. Acts that turnover seamless from playing into romping, fighting, surviving, losing, abandoning, struggling and vanquishing. Sometimes heroic acts take place, when small children go into the water to push the raft back to the other side where the child is waiting for help. Because the child on the left is in need of help, the acts of the other children become moral dilemmas. What do the children chose to do? Will they act heroic or do they avoid the situation? Water is often a symbol of the big unknown, full of secrets. During their journey the children have to make many choices, that makes them aware of their strong and weak sides. Characteristics like egoism, laziness, cowardice, and disinterest, but also pride, courage, and heroism are being challenged. The struggle leads to moral conflicts and strong human emotions.